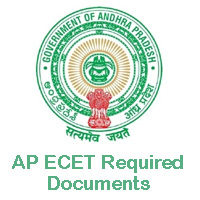 AP ECET Required Documents List available. Aspirants AP ECET Counselling Required Certificates for document verification. Check the details of essential documents for AP Engineering Common Entrance Test for Certificate Verification like Hall Ticket, Rank Card, Study Certificates, etc. on this page. You may also visit the Official Website apecet.nic.in for the complete list of Required Documents for AP ECET Counselling. JNTU Anantapur announced admissions for B.tech. A large number of people who completed a Diploma and B.Sc Degree applied for the AP ECET Exam. Jawaharlal Nehru Technological University conducted the ECET exam successfully as per the scheduled dates. Therefore, the applicants downloaded Admit Card and attended the Engineering Common Entrance Exam. So, candidates who are attending for Counselling can check List of Required Documents for AP ECET Certificate Verification process. Now the students are waiting to attend the Counselling and Certificate Verification. While attending for certificate Verification the applicants have to take some necessary documents along with them. Hence, we are providing the list of the AP ECET Required Documents in Below paragraphs. So, Check your merit list for attending counselling and certificates verification. AP ECET Exam is only for the Lateral Entry of Diploma and B.Sc Students. The applicants who qualified in the AP Engineering Common Entrance Test can get admission in B.tech. Therefore, the candidates who want to study B.tech have to qualify the JNTU Ananthapur ECET exam. Therefore, the applicants who are going to attend the Andhra Pradesh Counselling certificate verification have to take the below certificates along with them without fail. The necessary documents for Andhra Pradesh ECET certificate verification are given below. Hence, the applicants have to take them while counselling. You may also visit the official website for complete details. AP ECET 2019 Rank card. Study Certificate from IV to Diploma/ 7th to Degree to B. Sc. Maths candidates. Andhra Pradesh Residence Certificate of Father/ Mother for a period of 10 years excluding the period of employment outside Andhra Pradesh from Tahsildar in respect of Non-Local Candidates. Aadhar Card (Original will be returned after the verification). AP ECET 2019 Hall Ticket. Integrated Community Certificate, in the case of BC/ ST/ SC issued by the competent authority. Income certificate of parents from all sources issued on or after 01.01.2014/ White Ration Card (candidate name and either of the parent’s name has to be reflected in the ration card) only for those who claim the tuition fee reimbursement). The PH/ NCC/ CAP candidates can check the complete certificate list for the AP ECET Document Verification. Each special category candidates should have to carry the different set of Andhra Pradesh Engineering CET required documents list. Children of Ex-Service and InService persons who are domicile of Andhra Pradesh will alone be considered for allotment of seats under CAP Category. Certificates from the Zilla Sainik Welfare Board (viz) Discharge book & Identity card etc for Verification. Produce original certificates issued by competent authorities. The candidate should have represented from the state of AP. Above disability and the candidates with 40% are eligible. The Muslim and Christian Minority Candidates should bring TC of the SSC containing the Religion (Muslim/ Christian/ Other linguistic) or in the absence of TC, a Certificate issued by the Head of the Institution in which the student studied/appeared for SSC or its equivalent Examination. The Anglo-Indians have to submit a certificate issued by the Competent authority of their register place. All the candidates who are going to attend for the AP ECET Counselling and AP ECET Required Documents have to take the above documents with them. Hence, the applicants have to submit all original certificates and 2 sets of Xerox copies at the time of counselling. EBC CERTIFICATE IS REQUIRED BROTHER..TO AVAIL FEE REIUMBERSHIP…. if your father is govt.employe doesn’t need. I submitted ebc certificate while my polytechnic… i finished this year… is there a need to renewal of ebc certificate… pls respond !! Yeah…, EBC certificate is required for o.C candidates. i completed my diploma in kurool district…but my native s kadapa district…..in which district i have to attend for AP ECET COUNCELLING…..
Sir. Could u please tell me where to attend the sports category students for counseling. U first see notification after ask me sir. i’m an OC canditate. Please tell me that caste certificate is required for counceling or Not ? And you said caste certificate is required for certificate verification….. But somebody says caste certificate is not important for OC Candidates….. So what can I do sir……….? Sir, residence certificate is not giving in MRO office…they are saying aadhar card is proof for residence. But residence is asking in counselling what we should do? Is this real? Residence certificate agasaram ledha. Mari councelling ki avasaram aina certificates lo enduku residence certificate ni mention chrsaru. Is 6 th to 10 th study certificates are needed. cast certificate and residence certificate i have are 3 years ago they are applicable or not and income certificate is required or ration card enough?? Ration card is taken instead of residence certificate? Oc students will have white ration card(chakkera card in telugu). I am also oc. SIR MY NAME IS CHARAN KUMAR REDDY. FOR OC PEOPLE HAVE REQUIRED FOR EBC or OBC CERTIFICATE PLEASE TELL ME SIR. Is diploma TC required for counseling…..? Sir residence certificate is required or not. Is residency certificate is compulsory or not? Do I have to apply a new one or the old one is sufficient!!!? What is Residence certificate for preceding 7 years of the Qualifying ie diploma. Can anybody help fast reply please. Siry rank is 5227 and I have not attended the first counselling can I attend the next day plz teltel. Sir, 2014 or 2015 income certificate accepted or not?? I have a backlog in the last semester…..
Is am I eligible to attend for 1st counselling of ecet…. I have diploma provisional certificate though Is semester marks memos required for Counselling ? Sir i hav NCC ‘A’ cirtificate. Will it is usefull for ecet councelling? what are the E-Cet 2018 counselling dates ? and its online or offline ? Sir,my 1st year marks memo was missing.what should I do.? Study certificate 3 years mundu thisukunna… Adi saripotunda? Is there any need for renewal of ebc caste certificate after polytechnic !! Pls respond !! Sir I have been a one doubt that is ration card in my father name is sivalingappa but my all certificates on sivanna is there .so if any problem is occure In counselling. Plz respond me fast sir plz. Sir o im BC-e sir…i didn’t have my 1st year marks list sir…it is necessary for councling sir…. I paid fee on the day of counseling.Due to payment failure,money was deducted. There is still no refund of money.Hence I requested you to help me.